Chicago is my hometown, the north side and its close-in northern suburbs, one of which I grew up in, not born there but there since the age of six, so got my education there and had my first jobs there working at places like Hi-Lo Foods and the concession stand at the little league park. Later I lived in the city, worked in the city, played in the city, you get the picture, and, for the most part, it was all good. A little too noisy at times—especially some three in the mornings when people were out in the street fighting or reveling, car alarms going off, and then the prevalence of leaf blowers; and then, too, a little crowded at times with too many people, too many cars, and then those cars got so big, those SUVs; and then, too, after a while I just wanted to try something different, had always had this cockamamie idea about living in the woods, or on a farm, or along a seacoast, so at age 47 I moved away from home, north to the woods and farmland and seacoast of the U.P., never once thinking that ties to my hometown would be or could be severed or tested in any way. Indeed, I was sure I would go back to Chicago, could go back, any time, visiting or returning to resume, with a sigh of relief, perhaps, that life I knew so well. But a swift confluence of events coupled with my own personality made it such that when I moved away Chicago became lost to me, or should I say felt lost to me, and as it happened I never once returned for my own pleasure, of my own plan, of my own desire. And I accepted that. For many years, I thought it did not matter: I had no desire to go back. But sometimes I think we don’t know what’s happened to us until time has passed. Then we see how events both planned and happenstance have come to affect us and our lives. We live with these events, their aftermath, and we see what they make of us. 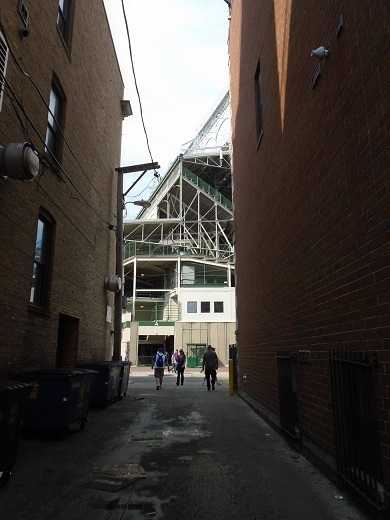 Wrigley Field through an alley off the el. 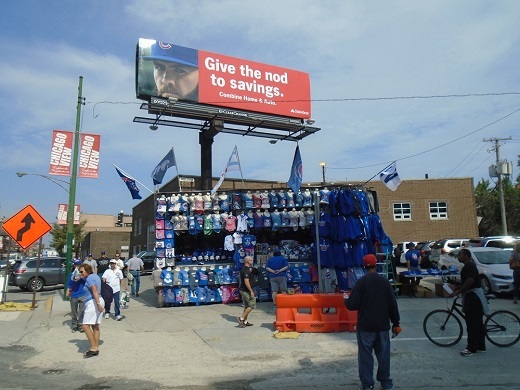 Earlier this summer, in idle conversation with my sister, I heard myself saying I was afraid to go to Wrigley Field—a place where I spent much of my youth and adulthood—because it was all so different now. I heard what I said, and it struck me that maybe I was afraid of my own life, either its past or its present, maybe the rub between the two, and I began wondering if I should go back to Chicago, just a short trip, knock out that fear. I had thought about a return the year before, for my 40th high school class reunion, but that’s a whole ’nother basketful of stuff, this was different, somehow more personal, and so for the first time in eight and a half years I began thinking seriously about a trip home. 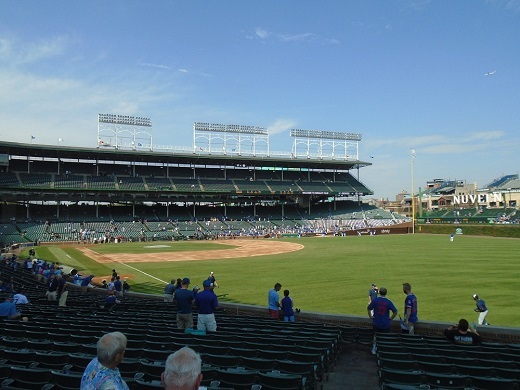 I decided to try to go to a weekday day game at Wrigley Field. Luckily my friend Deb wanted to go, too. She is a Tigers fan, never been to Wrigley, was keen to see Wrigley but not so much during the hot months, so maybe September. She tossed in the idea of going to Hecky’s BBQ after the game. 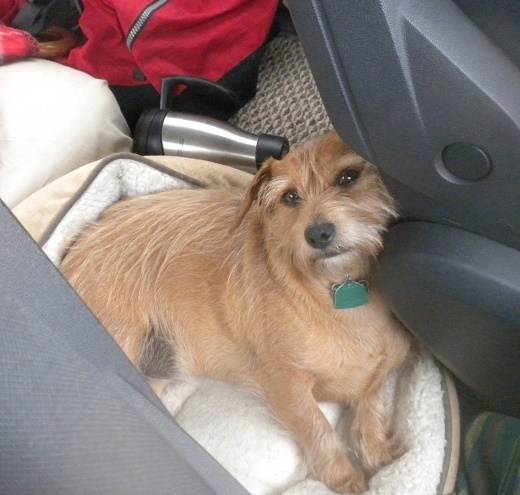 I happened upon a website, dogvacay.com, which offers up petsitters throughout the land, and I found a good one for Josie in Rogers Park, just a few el stops north of the ballpark, between the ballpark and Hecky’s. So Josie could go with. 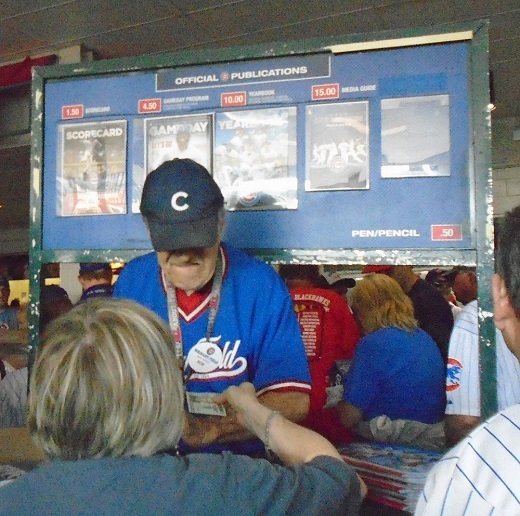 And I have a friend who lives on the north side of Chicago, goes to a lot of games, and he helped with some of the planning as Wrigley’s changed a lot in the past twelve years, since I was last there. 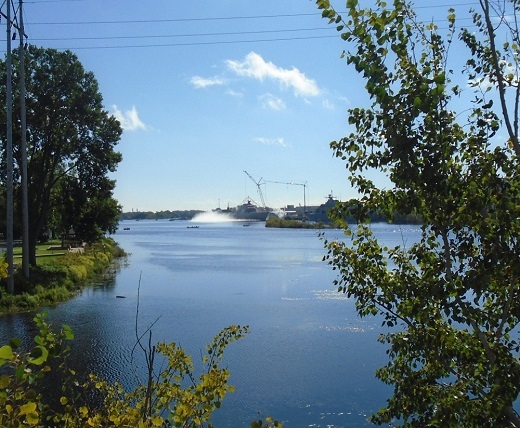 Massive ongoing renovation and a huge shove into the 21st Century has changed the park and the neighborhood it resides in, much of the neighborhood—shops, eateries, bars, the haphazard apartments above—reduced now to construction zone rubble. I had seen the pictures, but being there, live? So I read Thomas Wolfe and after a bit felt I had what I needed to give this going home again thing a try. I called it the Holy Goat Road Trip 2016. Apparently Josie likes awkward, hard plastic for a pillow. Late the night before, by virtue of another team’s loss, the Cubs, those perennial “lovable losers,” had become champions of the National League’s Central Division. 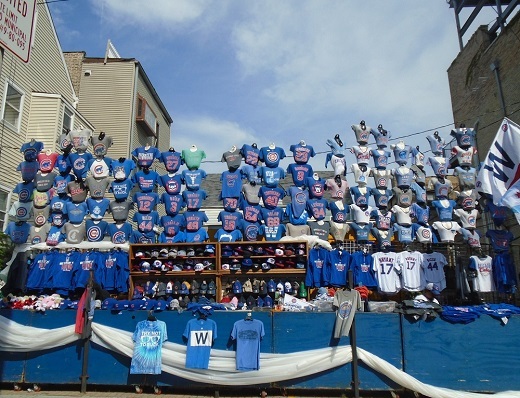 Wrigley and the surrounding neighborhood/construction zone was a sea of buzzing blue beneath skies of blue. Sure it was different, but it was also just the same. I walked around outside the park and inside the park (the drive down was smooth; the drop-off of Josie without a hitch except for almost when Deb and Frank, Josie’s caregiver-for-the-day, got to talking about hot peppers—Frank had a great backyard and was obviously quite the gardener—and I felt the need to cut them off, be impolite because I wanted to get on to Wrigley; and the el ride then like a thousand others, no problem) and old memories and new sights mingled, hey, just the way it is, holy cow and hey hey and man, there were a lot of people at that ballpark and I was just one. Of course it was not the same guy I knew selling bags of peanuts at the corner of Addison and Sheffield, but still there was a guy selling bags of peanuts on the corner of Addison and Sheffield. Because they’re cheaper outside. Scorecards are cheaper inside. The guy I bought my scorecard and pencil from. As I walked around, I talked to ushers and concession people, couldn’t stop telling how I was there for the first time in a dozen years and ain’t it beautiful. I’ve tried to think of something to complain about or to be irritated by and all I come up with is this: It could have been slightly less humid and maybe three to five degrees cooler. Deb lost her umbrella—the forecast was full of the possibility of rain so she brought the umbrella, forgot to leave with it. Otherwise … nothing. What’s to complain? What’s to bother? Well, Munenori Kawasaki could change his walk-up music. Not sure what tune that was. It does all get a little loud at Wrigley, louder than I remember. And Deb, who without hesitation will tell you she hates country music, did not like John Lackey’s good ol’ country boy walk-up song, but Tommy La Stella was at third so I got to sing “Oh what a night, late December back in ’63 … ” every time he stepped up to the plate. And David Ross pinch-hit in the seventh, walking up to “Forever Young” because he’s 39 years old and retiring and they all call him Grandpa Rossy, and we gave him a standing ovation, and that was great. He hit into a double play. can be kind of fun. The wind was blowing out, Wayne Messmer sang the National Anthem, the game moved along at a nice clip, Ryne Sandberg led the seventh inning stretch “Take Me Out to the Ballgame” sing-along, some hits and home runs had the score at 4-2, the Cubs losing, but they tied it up in the bottom of the ninth with some solid hits and an odd scratch hit and whatnot, leaving the bases loaded. La Stella came up that inning with one run in, one out, runner on first, just the perfect opportunity for me to shout “STELLAAAAAA!” That felt good. 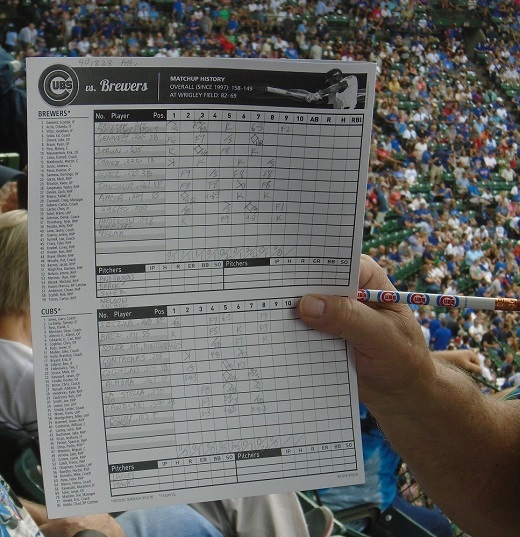 Guest scorecard, middle of the ninth. Top of the tenth, Aroldis Chapman takes the mound, throws about eleven pitches, strikes out the side. 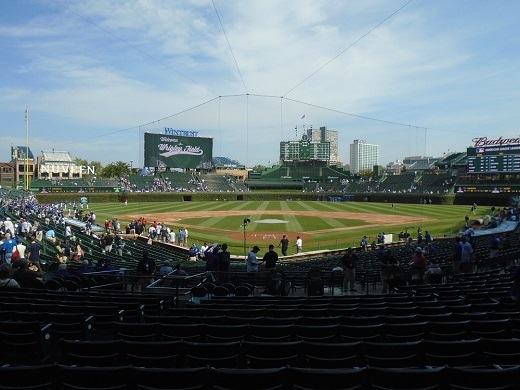 By this time I was used to those new huge video boards atop the back wall of the bleachers and I appreciated seeing the speed of each of Chapman’s pitches, particularly the last three: 102 mph, 102 mph, 103 mph. Strike one, strike two, strike three. You’re out, buddy. 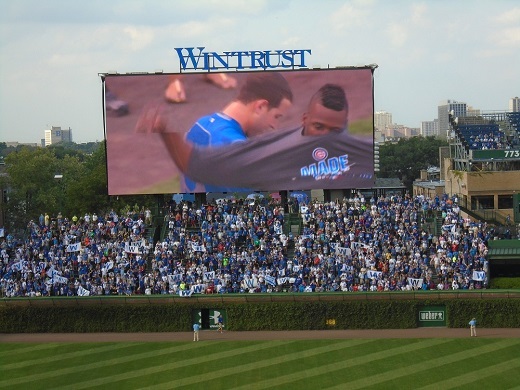 I’m pretty sure this is Chapman putting on his new T-shirt. My scorecard. 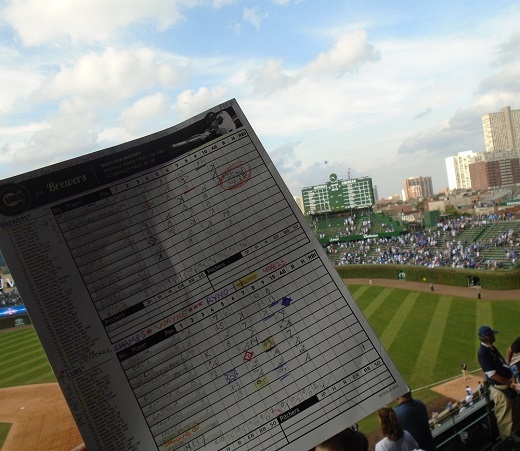 The Official Scorecard of the Best Game Ever. So it’s perfect. The Best Game Ever. Sing: “Go Cubs Go.” Sing: “Sweet Home Chicago.” Sing: “Taking Care of Business.” And who knew there was so much singing in baseball? 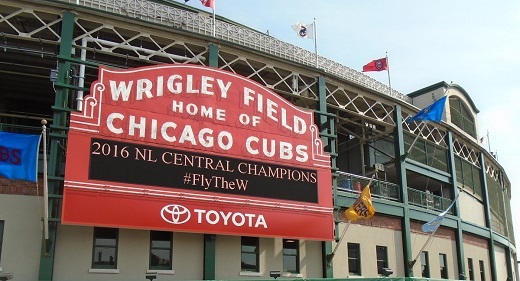 The players are celebrating on the field, getting their new championship T-shirts and caps; the fans are celebrating in the stands, singing and clapping and waving the W flag; and, seriously folks, the sun is shining on Wrigley Field and it is the best homecoming ever. I’ll say it again: Isn’t she beautiful? When we finally left the park, we used my dad’s old crowd-avoidance maneuvers to get on the el in short order, even got seats, and we picked up Josie, who, we were told, after an hour and a half stopped watching the gate I had walked through and had himself a fine time, then we drove up to Evanston to get those ribs at Hecky’s, driving by my old house on the way, and at Hecky’s we got to see that old friend who had helped with the Holy Goat Road Trip 2016 planning, and then we headed home, and funny thing, the house I grew up in was right on the way to the expressway so we got to see that, albeit at dusk. It looked good. From the outside, barely changed. Soon we realized we were a bit tired, so we stopped for the night in Belgium, Wisconsin, which put us in Menominee, the U.P., late morning Saturday and another whole big event, one I wasn’t quite sure about but that was, after all, worth the standing around for on the US 41 bridge over the Menominee River, worth it just to be able to tell of it—the launching of the future USS Wichita, a big navy boat built there in Marinette, Wisconsin, south side of the river, the boat being dropped into the river to see if it would float. We stood along the bridge with all these people waiting. Shouldn’t that little row boat be getting out of the way? Look! Lights flashing on the police boat! A guy with a smartphone told us there was a countdown to launch on some website and he looked it up for us. Countdown was at zero. We waited. Get those fishermen out of the way! Josie got impatient. A Very Big Deal. We waited. Then suddenly the boat, it falls off these support things, plops on its side into the water, there’s this big rolling wave, the boat rights itself, voilá, launched. There she goes and best of luck to you future USS Wichita. Back home late afternoon, Elliott wanders out of the wood shed / barn / garage, greets us by snacking on some long green grass. All is well. And by the way, welcome home. 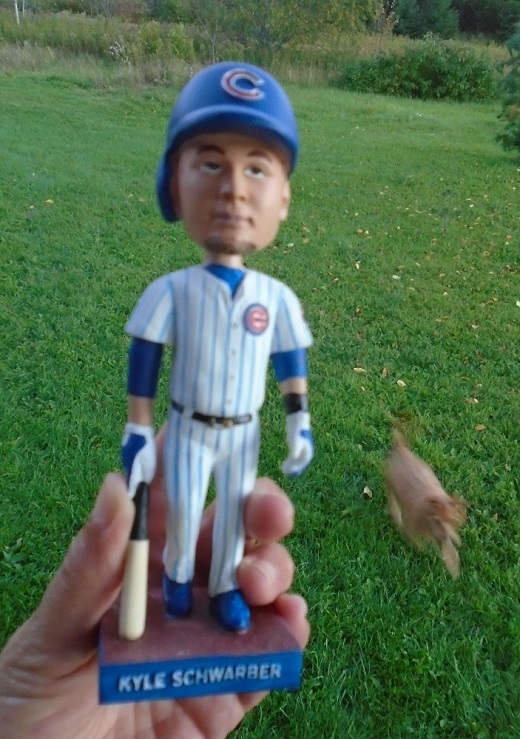 My souvenir Kyle Schwarber bobblehead. It was a give-away! If this wasn’t enough for you, there are more photos of the Best Game Ever on my Facebook page.